Cusco Discover Sacsayhuaman, Coricancha and the famous San Pedro market before enjoying a magical evening featuring an entertaining folklore show. Lima Explore the "City of the Kings" and see the Cathedral, Government Palace, Archbishop's Palace, City Hall and visit San Francisco Monastery, famous for its catacombs. Machu Picchu Journey to the marvellous citadel of Machu Picchu, one of the New Seven Wonders of the World. Enjoy trekking through the Inca Trail. It is currently shoulder season in Peru. Prices are good, and Peru's tour attractions aren’t crowded. Journey by train to and from the awe inspiring ruins of Machu Picchu. Discover the village of Ollantaytambo in the Sacred Valley. Explore Cusco, the former capital of the vast Inca Empire. 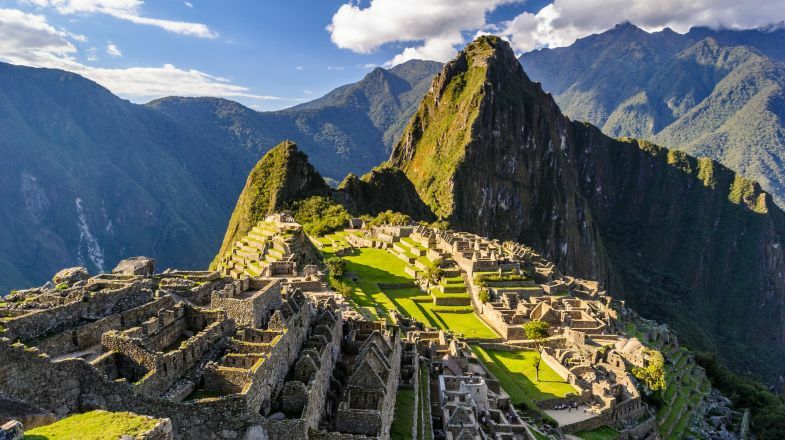 See Peru's highlights, from the Sacred Valley & Machu Picchu to Moray's amphitheatres. Visit the Amazon, fish for piranhas in its rivers. Take a train form Ollantaytambo to Aguas Calientes. Experience the raw nature of the massive Amazon Jungle. Explore an Amazonian research station’s many sights and sounds. Hike through the jungle canopy 100 feet above the ground. Meet the locals at an Andean homestay..
Spot soaring condors at Colca Canyon..
Trek to Machu Picchu for spectacular views in the morning. Experience unique animal species in the Amazon jungle. Take part in exciting 4x4 motorbike & rafting tours. Peru is as mysterious as its landmarks. It finds its way into most travel wish lists for one major reason – Machu Picchu, the Lost City of the Incas. They say that the moment you see Machu Picchu for the first time from that historic trail, you suddenly realize just how rewarding traveling can be, and tend to re-discover a long-lost part of your soul. You might only know about Machu Picchu, but the fabled city is just the beginning. Peru was once home to a thriving pre-Columbian civilization that had dominated the region before the Spanish. The Incas were responsible for creating some of the most beautiful archaeological wonders, combining striking architecture with jaw-dropping natural beauty, making the country feel alluring and enchanting. Another adventure during your trip to Peru awaits at the Nazca lines, ancient markings that make you think twice about the existence of aliens. Hike the Inca Trail, or its other famous alternative routes like the Lares Trek or Salkantey Trek. Machu Picchu can become very crowded during high season. Beat the crowds by staying nearer the site the night before your visit, and be sure to book your tickets ahead of time to avoid disappointment. Stores often shut down for the afternoon siesta, so always plan your meals in advance. It's advisable to not drink the tap water. Many hotels provide bottled water, which should also be used for brushing your teeth. Altitude sickness can be a real issue for some people visiting Peru. Try combatting it with coca leaf tea, a Peruvian remedy that is readily available across the country. Chewing the leaves can have the same effect. On a holiday to Peru, don't skip a visit to Lima. Peru's largest city is often overlooked for hotspot tourist destinations but is full of great food and interesting museums that you'll regret missing out on. Always carry cash when travelling through Peru as many shops will not accept credit cards. Peru has seasonal weather so please do check up on the best time to visit Peru before planning your tour. And if you’re still hunting for more things to do and places to explore in Peru, do check out our Peru Travel Guide for more information.